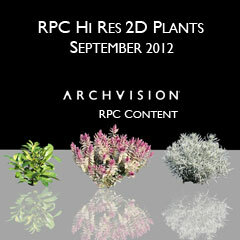 ArchVision is pleased to announce the addition of three new hi-res outdoor plants to the RPC Content Exchange. This collection of plants includes the feathery pink outdoor plant , outdoor plant  a short leafy green plant, and the silver-grey santolina plant. Each of these hi-res plants are a perfect addition to your next landscaping project. ArchVision Software License plan customers have access to these and thousands more. Check out all of the latest RPC Content added to the RPC Content exchange by clicking recently added from ArchVision Dashboard. Download the ArchVision Dashboard to test these out now.